The X1, aka “SEX1,” is an entry-level FET condenser microphone, designed specifically to outperform competitive models at a sub-$200 street price. The capsule is described as “hand-built.” It is a large-diaphragm, center-terminated design with at outside diameter of 32mm. Based on photos we’ve seen, the capsule has two backplates, and the characteristic K67 drilling pattern. The rear diaphragm is clear (not metallized). The circuit is transformerless, and is built with a combination of surface-mount and through-hole parts. The headbasket grille is a dual layer of metal mesh (previously reported here, incorrectly, as a single layer) — a fine mesh screen lines the inside of the grille. The face of the grille is sloped to reduce standing-wave coloration. 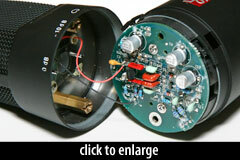 Switches on the front of the mic body provide a -10dB pad and a high-pass filter. The filter appears to operate at a higher cutoff frequency (approximately 500Hz), and with a milder slope (4dB/octave) than is typical. The mic’s frequency response is nominally flat from 30Hz–3kHz, and has a smoothly rising presence peak (+3dB) around 12kHz. At 25.1mV/Pa, the mic’s sensitivity is higher than many competitive models. Its self-noise (16dBA) is relatively low, making the mic suitable for recording quiet sources. The body of the X1 is finished in a non-glare, slightly rubberized paint, which likely reduces body resonance. The mic ships with a mic clip only. It attaches via a tight plastic collar that snaps around the stem housing the XLR jack. A flight case and shockmount are available separately.